This view of the Smoky Mountain Power Plant at Ela, near Bryson City, was dated October 18, 1937. It emphasizes the growing importance of hydroelectric power in western North Carolina, both in terms of generating facilities and consumption. 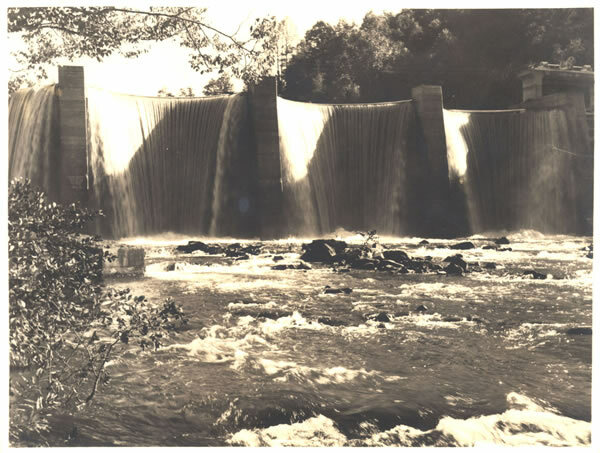 The dam, on the Oconaluftee River near its confluence with the Tuckasegee River, was built in the mid-1920s as a municipal power plant and purchased by the Nantahala Power & Light Company in 1942. 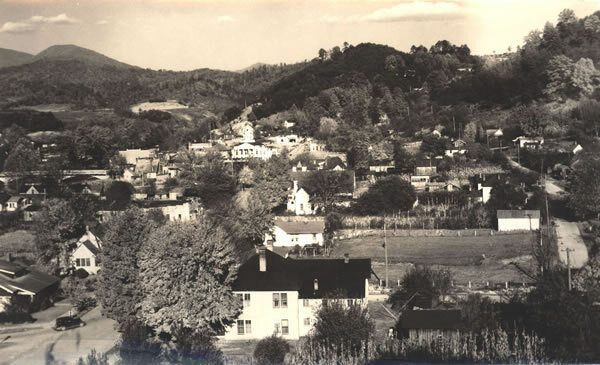 Nantahala Power & Light Company’s principal office had been located in Bryson City when the company was chartered in 1929, but relocated to Franklin, North Carolina, in 1937. On April 2, 1931, Horace Kephart, a prominent proponent of the Great Smoky Mountains National Park and resident of nearby Bryson City, died in a tragic automobile accident near Ela, at Coopers Creek. The comment about “that fotch on stuff” in the last sentence refers to items that would have been purchased in a store, as in cloth, and often with the implication that it was an inferior product to homemade materials. 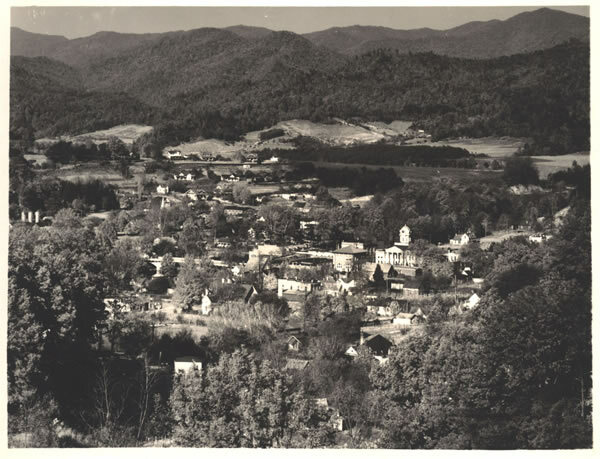 This collage of photographs, taken on November 1, 1937, features Bryson City (top left), the Little Tennessee River as seen from the Franklin to Bryson City road (bottom right), and a second view of the river (right). 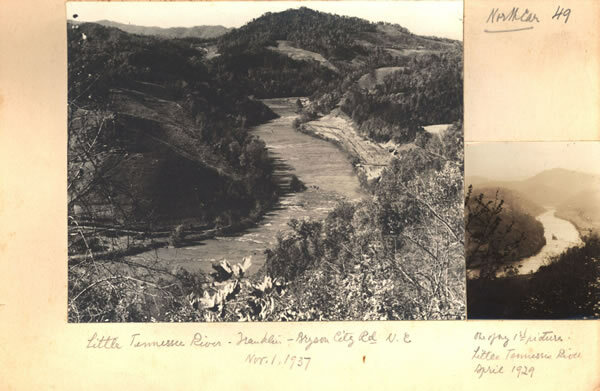 A handwritten note to “See pictures on other side taken from this spot” reveals two additional pictures of the Little Tennessee, one again taken on November 1, 1937 (right), and another taken from the same spot in April 1928. Even though this particular stretch of the river was not affected, at the time the pictures were taken the Little Tennessee River was under consideration for construction of a large-scale dam that would ultimately submerge stretches of the river to form the Fontana Reservoir. 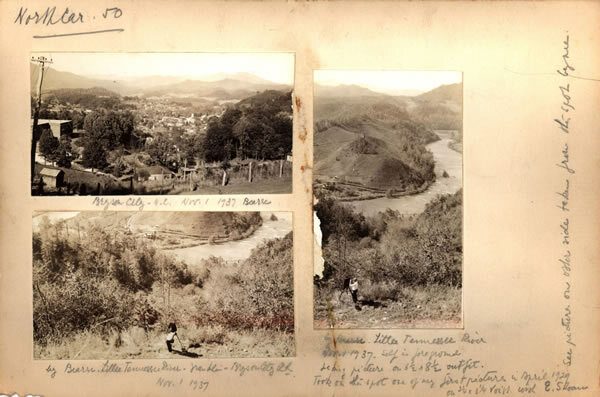 As indicated in the handwritten captions, the road between Franklin and Bryson City had permitted access to this scenic view. Bishir, Catherine W., Michael T. Southern, and Jennifer F. Martin. A Guide to the Historic Architecture of Western North Carolina. Chapel Hill and London: University of North Carolina Press, 1999. Black, Ellen Engelmann. “A Study of the Diffusion of Culture in a Relatively Isolated Mountain County.” M.A. thesis, University of Chicago, 1928. Cotham, Steve. The Great Smoky Mountains National Park. Charleston, S.C.: Arcadia Publishing, 2006. Farwell, Harold, Jr., and J. Karl Nicholas, eds. Smoky Mountain Voices : A Lexicon of Southern Appalachian Speech Based on the Research of Horace Kephart. Lexington: University Press of Kentucky, 1993. Frome, Michael. Strangers in High Places: The Story of the Great Smoky Mountains. Expanded ed. Knoxville: University of Tennessee Press, 1994. “History of the Nantahala Power and Light Company.” Typescript, Nantahala Power & Light Company manuscript collection, Hunter Library, Western Carolina University. 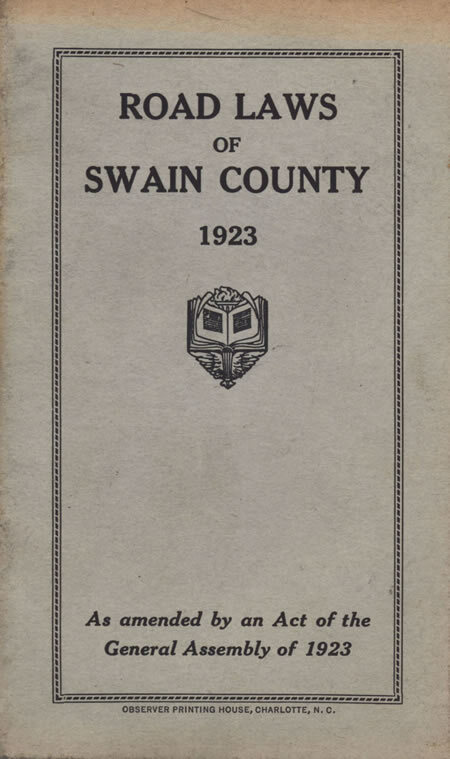 Kephart, Horace, “Trips in the Smokies, 1930.” Published by Bryson City Drug Company. Kephart, Horace. Our Southern Highlanders. Knoxville: University of Tennessee Press, 1984. Montgomery, Michael B. and Joseph S. Hall. Dictionary of Smoky Mountain English. Knoxville: University of Tennessee Press, 2004.